Jamie Michie with Locos manager Neil Cooper. The defensive midfielder made more than 100 appearances for Locos between 2008 and 2015 before joining Formartine United. But after three seasons at North Lodge Park he has returned to his hometown team, signing a deal that will keep him at Harlaw Park until 2021. Locos manager Neil Cooper was delighted to get the deal completed. He said: “Jamie is dynamic and energetic. “He provides us with options and cover and he’s a welcome addition. “We knew Jamie was going to be out of contract at Formartine and we would like to thank them for releasing him from the remainder of his contract, which would have been up at the end of July. “Jamie’s a versatile player who has always been popular with everyone at Locos and with our supporters. Locos manager Cooper has high hopes for next season after his club’s third-place finish last term. He added: “Every team starts the season wanting to do well and to finish as high up the league table as they possibly can. “We’re no different to that and we need to try to maintain the level of performance we showed this past season and hopefully we will be up there again with the chance of lifting the title. l Brora Rangers defender Ally MacDonald has agreed a new two-year contract at Dudgeon Park. MacDonald is a long-serving member of the Cattachs’ squad having initially joined from Elgin City in 2009, although he spent a short period playing in America during that time. 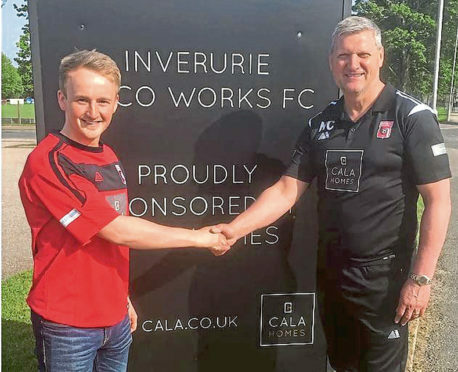 The 29-year-old, who began his career with Caley Thistle, hopes Brora can hit the ground running under new manager Steven Mackay. He said: “Both Steven and Craig Campbell are highly respected among the boys and have had successful careers as players. “I’ve no doubt their transition in to management, coupled with their passion and determination, will bring more success to Brora. Mackay was keen to tie up a new deal for MacDonald, who he sees as a key part of his plans, and he said: “Ally is a player that every manager would want in their team, he plays football the way it should be played and at times makes it look effortless.